Tatjana, or "Shrug" as we now call her, tried her hand at bowling on Mike's birthday recently. Luckily, for us all, the bumper rails were up so it was more like playing pool, than bowling - since the ball continued to bounce off the rail all the way to the pins. Fun for the kids though and something different to do. 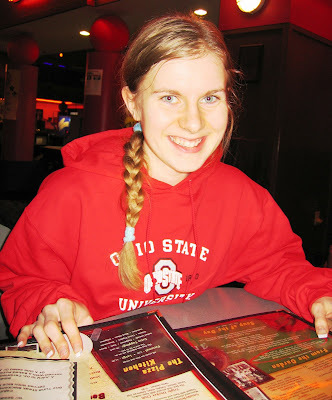 Note the Ohio State sweater - her Christmas gift exchange from Max.